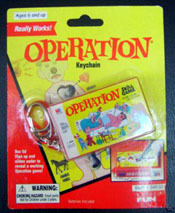 Current feature: Operation, the game, a battery operated game spanning 40+ years! 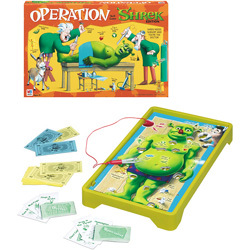 Operation, is the dexterity game in which you must extract body parts from a hapless patient. If you are sloppy, the patient's pain is indicated by a sudden buzzer, and a nose that lights up red. What is the story of this game spanning 40+ years! Operation began in 1965. The original game was marketed by Milton Bradley, it was originally invented in 1962 by John Spinello. The original prototype was a steel block with holes in it and a probe. It was called Death Valley. 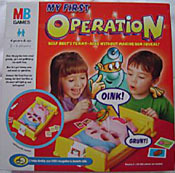 Ultimately the game added removable pieces and was changed to "Operation" as the official name. John Spinello never truly got the credit he deserved for the game by the toy company, but if you look up the US patents for the game and the idea, he is proudly listed as the man with the original idea on the patent. There are some great images and highly detailed information in the book "Timeless Toys", by Tim walsh. It is an excellent book for details and trivia on these pop culture toys. I encourage you to grab a copy. 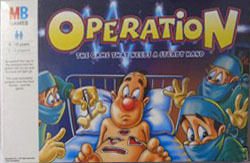 The first versions of the game had desirable box art by collectors featuring a doctor that was smoking(Photo to the right). After all, smoking was the hype in the 1960's. Heck, even Fred Flintstone was smoking in commercials. Action figures like Marx's Mike Hazard agent had cigarettes and a lighter! Versions of the game from the 1970's – the present of course eliminated the “Smoking Doctor”, (photo to the Left). Games are of course produced today by Hasbro in many variants. The game is a spin-off on the old-fashioned wire loop electric game popular at fun-fairs. 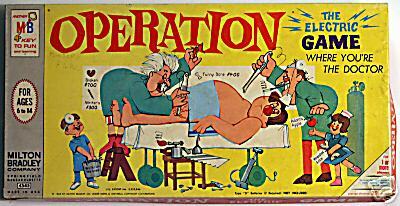 The game consists of an "operating table", lithographed with a comic likeness of a patient ("Cavity Sam") with a large, red rubber coated light-bulb for his nose. In the surface are a number of openings, which reveal fictional and humorously-named ailments made of white poly-plastic. There are two sets of cards: Doctor and Specialist cards. The Specialist cards are dealt out evenly among the players at the beginning of the game.Players take turns to pick Doctor cards, which offer a cash reward for removing a particular ailment, using a pair of tweezers connected with wire to the board. If a player successfully removes the ailment then they'll win the amount shown on their card. 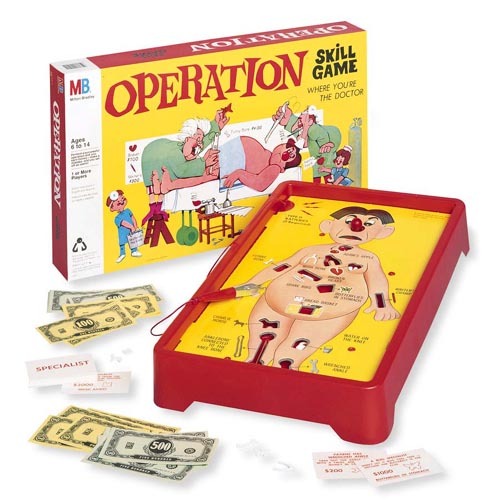 However, if the tweezers touch the metal edge of the opening during the attempt (closing the circuit), a buzzer sounds, the patient's nose lights up red, and the player loses their turn. The player holding the Specialist card for that piece then has a try, getting double points if they succeed. The winner is the player with the most money after all the pieces have been extracted. The game can be challenging, due to the shapes of the plastic ailments, and the fact the openings are scarcely larger than the ailments themselves. Gameboard with tweezers, 24-26 cards (Brain freeze adds a card to make it 26), 12 – 13 parts, see below, brain freeze adds a card to make it 13, Play money Rubber band for cards Requires 2 “D” Batteries..
 Adam's Apple: in the throat. Worth 100 points.  Charley Horse: a small horse resting near the hip joint. (A play on the real charley horse, which is a sudden cramp in the leg or foot, that can be cured with massage or stretching.) 200 points.  Spare Ribs: two ribs fused together as one piece. 150 points.  Funny Bone: a play on the anatomical name for the arm bone — the humerus. 200 points.  Butterflies in the Stomach: a large butterfly in the middle of the torso. The name comes from the feeling in the stomach when nervous or afraid. 100 points.  Bread Basket: a slang word for the stomach, this is a difficult piece to remove. It is a very small slice of bread, with only a small notch taken out of the top for grip. 100 points.  Wish Bone: located on the left side of the chest. 300 points.  Water on the Knee: a pail of water in the knee. 150 points.  Writer's Cramp: a pencil in the forearm. 200 points.  Broken Heart: a heart shape with a crack through it on the right side of the chest. 100 points.  Wrenched Ankle: a spanner in the right ankle. 100 points.  The Ankle Bone's Connected to the Knee Bone: This is not a plastic piece, but rather a rubber band stretched between two pegs at the left ankle and knee that has to be unhooked. 200 points.  Brain Freeze: an ice-cream located in the brain. 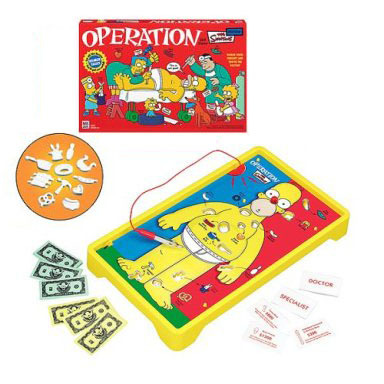 (This is the feeling when you inhale ice cream down too fast, or those slushies you slam down on hot days)This is the newest addition to Operation, was added ~2004 to Operation Board games. 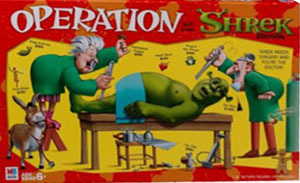 Shrek patient game board with tweezers, 24 cards, 12 gruesome Funatomy parts, play money and instructions. Requires 2 AA batteries (not included) required. For 2 or more players. Remove Homer's Bowler's Thumb, Pot Belly, Foot in Mouth, Rubber Neck, Trick Knee, etc. 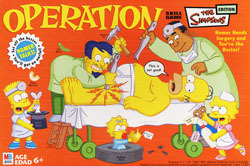 In Operation - Simpsons, the patient talks back! Homer's got problems: a pea brain, a potbelly, bowler's thumb, and more. 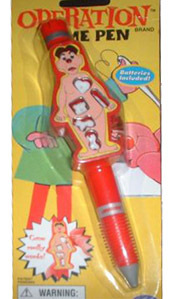 In this classic game of removable parts, you get to be his surgeon. Can you fix him up without setting off the buzzer - and Homer's big mouth? If you touch the sides with the tweezers, Homer will moan, groan, or give you a piece of his mind. Earn money by performing successful operations, and when it's all said and done, the richest doctor wins! 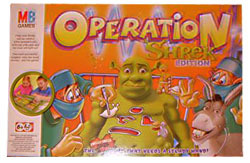 Other versions aside from the traditional board game version, Milton Bradley also produced a hand-held version, a brain surgery version requiring the player to pull pieces out of a wisecracking Cavity Sam's head, and more recently a special edition featuring the animated character Shrek. This photo to the Left, shows a pen accessory. This is also a great option to add more fun to the game. Just like the original game's famous feature, the mini Operation® keychain buzzes and lights as the tweezers remove 3"body parts." Be careful, and don't forget your bedside manners. Picture in the table below. Picture to the right shows a neat 1/6 scale version for the Christmas tree!